A General English course designed for the needs of junior students. This is a perfect course for young learners who are looking to improve their speaking, listening, reading and writing skills. 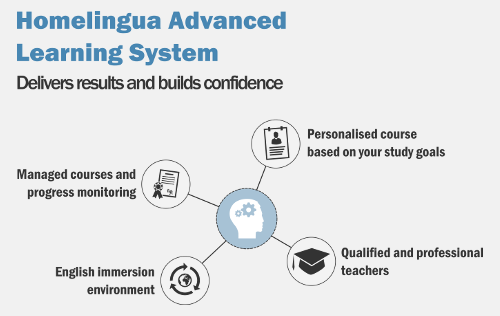 The total immersion environment means that junior students speak and listen to English all day, helping build your child’s confidence and increase their English ability. Your teacher will assess your child’s level of English at the beginning of the course and plan a personalised course. The teacher will focus on language points and skills the student finds difficult and help make the maximum progress possible. Our teachers can also customise the course based on your child’s study goals, interests and hobbies, language needs and other special requests. Our young learner teachers are experienced in looking and teaching children and your child’s safety is our number one priority. For more information read the student safety page. Petra’s father contacted Homelingua because he wanted a course to help boost his daughter’s confidence in speaking English and help with her grades at school. Petra studied with Dennis in Manchester. The course focused on pronunciation, fluency and activity based learning to help develop confidence. Petra visited Manchester, Liverpool, the Peak District. She baked scones and cakes, played badminton with the teacher’s friends and went for cycle rides in the Peak District. An example of a junior English course timetable.